On this page we will list all of the products we offer as part of our best sellers line. Please check in often because we will frequently update the product pages with new items. Here we have 55 pokemon cards, there are 5 of each energy cards and a variety of basic pokemon, evolved pokemon and a selection of trainer cards, these cards are an brilliant starter collection. This is a Gameboy advance game called Mario Party Advance. Its a brilliant adventure games. 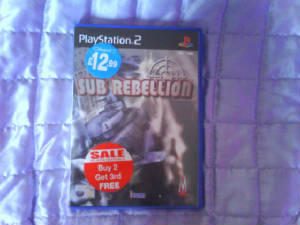 This is a excellent play station 2 game called Sub Rebellion. This is an action adventure game about an underwater world, where you control your crew and ship.